Due to colder temperatures and forecasted rain, all remaining paving work on westbound US 2 is postponed until spring 2019. Sign up to receive email updates about this project and other Snohomish County topics. Contractor crews with Lakeside Industries will repave three miles of the westbound lanes of US 2 from Bickford Avenue to the I-5 interchange, including the Hewitt Avenue trestle. The eastbound lanes of the highway have been resurfaced from the US 2/SR 204 interchange to Bickford Avenue. Why is WSDOT rehabilitating the existing pavement on roughly three miles of US 2 in Everett? This stretch of highway hasn’t been repaved since 2002. The asphalt used during that project was identified as having an average lifespan of about 15 years. Since then, cracks, ruts and potholes have developed. This creates an uneven surface which allows water to pool on the roadway. Wet roads create difficult driving conditions and can also result in slower travel times as drivers reduce their speeds to handle the slick surface. Installing new pavement will also extend the life of the highway. When crews remove the pavement in the westbound lanes, they will take the opportunity to also inspect the trestle and make any necessary repairs. This process requires more space and time than an overnight lane reduction allows, so the inspection and repairs will happen during six westbound weekend closures of the US 2 trestle. The eastbound trestle is newer and made of concrete, so it does not require weekend closures. Work on eastbound US 2 between the SR 204 interchange and Bickford Avenue will happen overnight. This project will make this section of US 2 safer for the 22,000 drivers who use it daily. New pavement also reduces future maintenance needs and costs. Safety: Repaving the highway removes existing cracks, ruts and potholes where pooled water can collect, causing cars to slide. This water can also freeze, creating pockets of ice on the asphalt. 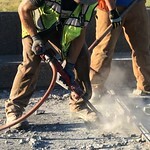 New pavement will also prevent future damage to the roadway. Economic: Repairing aging asphalt is a cost-effective way to protect the roadway and increase its lifespan. Spring/summer 2018: Weekend closures scheduled. Spring/summer 2019: Construction scheduled to be completed. View photos of crews working on the westbound US 2 trestle.